I’m Senior Manager of Product Management for Syniverse’s Enterprise Risk Management solutions, and I work in the Bangalore, India, office. I joined Syniverse this year, but, as a mobile user, I’ve been interacting with Syniverse indirectly ever since I’ve had a mobile phone. I presume this is true for a lot of us. I’m working on refining some products in our Risk Management portfolio, specifically related to our Revenue Assurance products. These products provide accurate data on a customer’s entire revenue flow and identify any problem areas in the end-to-end billing cycle that can be enhanced to minimize revenue leakage. That each new innovation in mobile services not only transforms the way we communicate in a technological sense, but it more broadly transforms the way we conduct business and the way we interact socially. Undoubtedly, my best moment at Syniverse was when my managers entrusted me to work on refining our industry-agnostic Enterprise Risk Management product portfolio. Our goal is to make the products easier to use, more flexible for adaptation to specific customer situations, and more protective through the addition of a higher level of security. After three months, we have become such a close team that we feel as if we’re part of a start-up. The sheer pace at which we’re progressing and the support that we’re receiving from our management have made the whole experience rewarding. Getting an opportunity to work with the best minds – be it in engineering, finance, legal, marketing or sales. Everyone comes together to help us deliver the best product. When they come together to meet a customer’s needs, you can always see synergy in action and an outcome that is greater than the sum of the individual parts. I own a Samsung mobile powered by the CyanogenMod operating system. At first, I thought the answer would be WhatsApp, YouTube, Twitter or Google Photos. However, to my surprise, when I checked my app usage on my mobile, I found that OverDrive [an app that allows users to borrow e-books, audiobooks, and other content from public libraries] is my most used app. Without any doubt, it’s when my four-year-old son, Jonathan, takes my mobile and watches his favorite video on YouTube! These days most of my time is spend with my son and my family. Outside of that, I love reading and traveling. 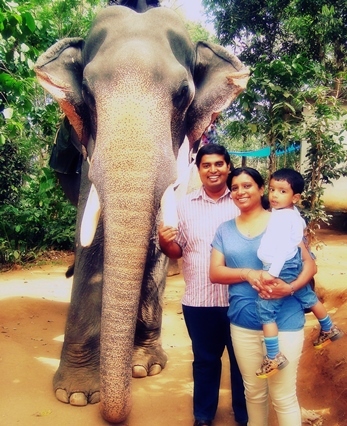 My wife and I prepare our son, Jonathan, for his first elephant safari, in Kerala, India. 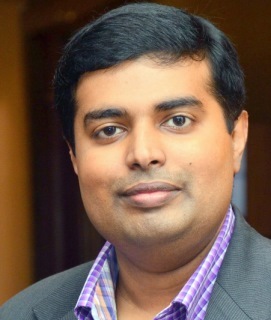 Jeeson Thekkekara is a former Senior Manager of Product Management at Syniverse. Thanks for sharing your thoughts,views and experiences in your professional life…I hope, you are enjoying life with Syniverse, Bangalore. Also i hope you are balancing your personal and professional life for a better productivity. Interesting profile, Jeeson. Love the elephant safari photo! Jeeson, Good to see this post.